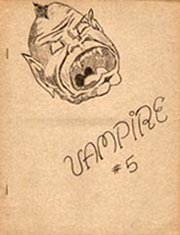 Vampire (1945) - ZineWiki - the history and culture of zines, independent media and the small press. Vampire was a fanzine published by Joe Kennedy, later known as X. J. Kennedy, in the 1940s in Dover, New Jersey, U.S.A.
Kennedy published the first issue of Vampire in Spring 1945. This issue was 5.5 X 8.5. The next eight issues were all 8.5 X 11, and produced by mimeograph. The ninth and final issue appeared in 1947. Vampire has been cited by writers and fan historians as being popular and a focal point of the period immediately following WWII. Perhaps it didn't hurt that Joe Kennedy was also a prolific letter writer to other zines. The Contributing Editors were Lloyd Alpaugh, Jr., Jay F. Chidsey, Joe Hensley, and Gerry de la Ree (Sun Spots, Loki, Beowulf). Included in Vampire was F. Towner Laney's (The Acolyte) fanzine review column, "Fanzine Scope". Other contributors included Lloyd Alpaugh, Jr., Jay F. Chidsey, August Derleth, George Ebey (Sappho), Henry Elsmer, Jr., George R. Fox, Ray Karden, Kenneth J. Krueger (Space Trails), John Holbrook Kaley, Sam Moskowitz (New Fandom), Norman F. Stanley (Fan-Tods), Dale Tarr, Tigrina (Hymn To Satan), Al Weinstein, George T. Wetzel, and Jimmy Wheaton. Joe Kennedy later added an 'X' to his name and in the 1970s edited the journal Counter/Measures with wife Dorothy, and became poetry editor of Paris Review. He was a prolific author, writing at least 13 books, editing several anthologies, as well as writing at least 15 books for children. In 1948, Boff Perry published Vampire Index, listing the contents and authors of each issue. This page was last modified on 21 May 2012, at 17:58.